THE BLOG TAKE HOME: Tinnitus is commonly known as ringing in the ear of a person. It can be very annoying and the noise intensity can vary from person to person. Tinnitus arises when mitochondrial capacity or acoustic fidelity are disturbed to remove some built in flexibility of the acoustic aparatus. The basis is an altered energy flow from mitochondria some point source in the acoustic system. Is the point source in the external auditory canal where skin melanin are? Is there a pigment relay center on the coclea that the brainstem pays attention to in Ammon’s horn? Yep. The colony of mitochondria in Ammon’s horn can be thought of “looking for the right frequency” from the environment so that the mitochondria in the brain stem can properly tune into the sound program in the environment of the person. It needs the afferent reflex arc to do this properly. This is accomplished when the inner mitochondrial membrane can make energy easily by increase tunneling speeds to become the ideal antenna for sound waves. When acoustic mitochondria are “tuned in” properly they become better able to use beta oxidation for fats and the TCA cycle for glucose. This process begins with light and not sound. How is that for a shocker? The key to understanding neuronal function is understanding how a reflex organizes the entire nervous system. This goes back to the work of Sherrington in the 19th century. Bereft of incoming signals, the neurons lose the feedback control and they begin to do things they usually would not do. I believe, this is what gives the phantom sounds of tinnitus. Neurons tuned to the tinnitus frequency in the auditory cortex became less active, thus this alters the reflex arc between the cochlea and the auditory cortex and brainstem. 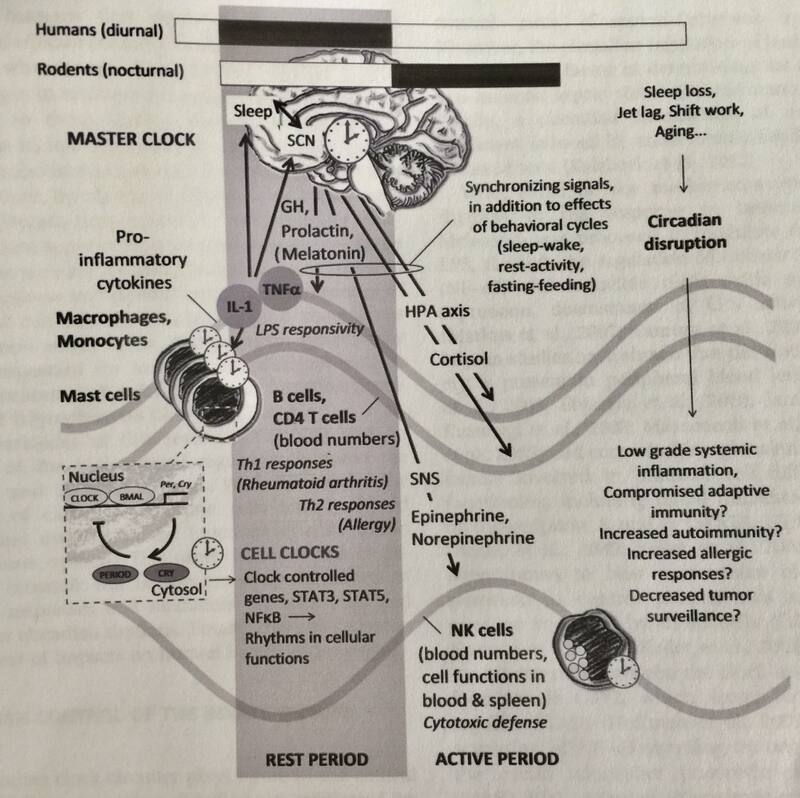 In all of these places, their is wide spread energy deficits in mitochondria that reduce the activity of neurons. Calcium efflux, which alters the secondary message system, is usually behind this effect of lower energy out put of tissues. It turns out, of the 5 senses, hearing uses the most energy because its ability to distinguish waveforms is so sensitive. For example all humans can tell the difference between a sound that is 30 Hz or 60 Hz. The same is not true about our eyes and vision. Few people can sense the difference between a pulsing light at 30 cycles a second versus 60 cycles a second. I have a sense tinnitus might be an allergic response to non native electromagnetic fields. This CPC will lay out that case. DOES TINNITUS RELATE TO blue light and nnEMF? 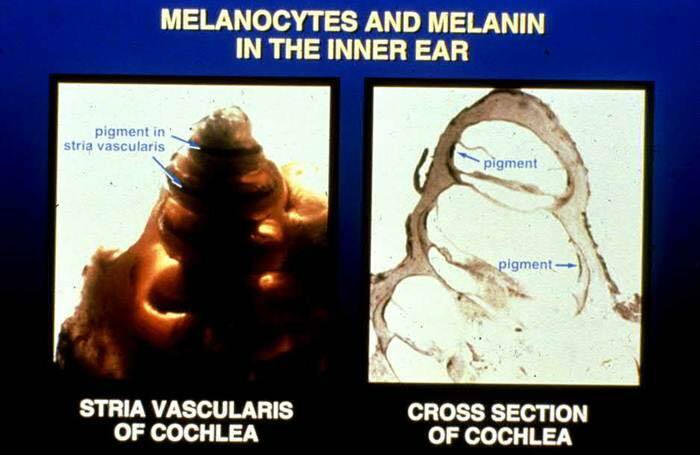 In the human ear there are melanocytes which form melanin. Melanin is a UV light absorbing pigment. Why is it present in our hearing apparatus? Might melanin be how we tune into our environment first? In this system, full spectrum solar light is critical. 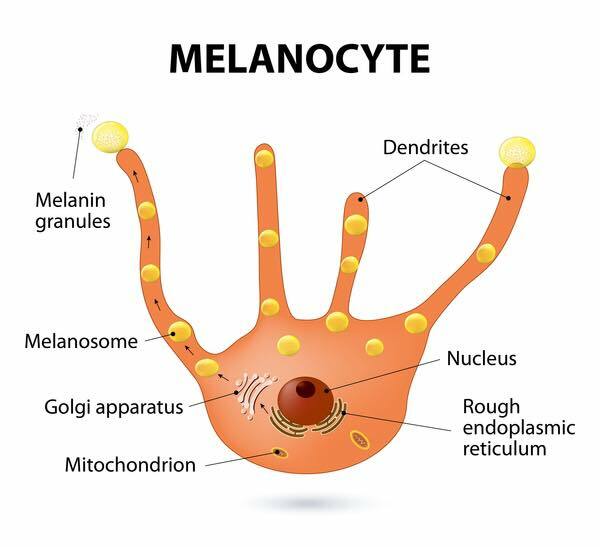 Melanocytes make melanin from aromatic amino acids that all have hexagonal rings of carbon that absorb UV light from 250 nm to 400 nm. For this mechanism to tune properly, you first need AM balanced light in the visible spectrum that has no UV light present. The dose of blue light present is stimulatory to the pitutiary gland but this pro growth stimulus is always protected and balanced by the 42% of IR-A present. The next light that shows up diurnally in solar exposure is UV-A light in the AM. Melanosomes in the ear pay attention to its arrival by having melanin’s electrons become excited by the sun rays. To activate the systme the ear pinna and external auditory canal need the full day spectrum solar light to develop naturally. This includes IR-A, UV-A and UV-B based upon your latitude and altitude. The human ear effectively “measures” the light radiation environment you allow and reacts with the formation of melanin as hearing protectors. If the radiation environment is disturbed (by man made light), no melanin is formed in the pinna or in the external auditory canal. Human hearing is affected and our hearing becomes susceptible to an improper transformation. People forget that when light collides with melanin the electromagnetic wave becomes and electro-mechanical wave or phonon. What is the target of this phonon or soliton? Look at the picture below. Is there a pigmented vascular layer in the inner ear? Yes. Why do we have light pigments in our cochlea? And why do we have melanin in our pinna and our ear canal? Those phonons are targeting pigmented cells in the body of the cochlea. If solar light is absent and man made light dominant in your environment the transformation these light waves into mechanical-acoustic signals (phonons/solitons) is disturbed. This is how tinnitus begins quantum mechanically in my opinion. The reflex arc is disrupted by nnEMF light waves sensed on the external ear and in our ear canals. Scott says, “So at night when I shutdown the power to the home, I go to the circuit breaker to do it at this time. That outputs around 100+ milliGauss when in close proximity to it. Doing this at 10pm before going to sleep I’m thinking can be disrupting, even a 10 second exposure. In the first month of moving into my new home, I noticed that after getting into bed and shutting down the power, I get a few minutes of tinnitus afterwards. So if you’re following my pattern, I’ve semi-scientifically connected “the shutting down of the power” to “my exposure and the quick tinnitus” thereafter. To compensate, I think I’ve successfully hacked it in a way you may not expect. After flipping the switches, I perform ‘Immediate Grounding’ immediately thereafter (within about 10 seconds). I can do this because in my home, I have an internal stone-wall that’s connected to the earth (image below). So I experimented this past week. Can electric power grid create heat? What controls the flow of heat? Magnetic fields do. Does grounding effect the acoustic phonons in the ear? Yes. Why? All acoustic phonons and heat are controlled by magnetic fields. We’ve known that since 2014 because of work done at Ohio State. Folks are surprised to learn that heat and sound have anything to do with each other, much less that either can be controlled by magnets. Cells contain mitochondrion that are nanosize magnets. Melanin gets magnetized by UV light frequencies and its electrons get exicted by UV light. Melanin is also loaded with hexagonal rings of carbon. How is all this linked? Heat and sound are expressions of the same form of energy, quantum mechanically speaking. So any force that controls one should control the other. UV light creates the most heat of any solar frequency when it is absorbed. Mitochondrion release IR-A light too as heat. Essentially, heat is the vibration of atoms. Heat is conducted through materials by vibrations. The hotter a material is, the faster the atoms vibrate. Our ear pays attention to this. So does our circulatory system. Porphyrins in RBC’s absorb 250- 600 nm light. That light can be converted to other forms of energy in our circulatory system. One of the ways this happens in the ear is the interactions of melanin, nitric oxide, melatonin and the RBC’s in the surface of our ears. Sound is the vibration of atoms, as well. It’s through vibrations that we communicate, because our vocal chords compress the air and this create vibrations that travel to your ear, and you pick them up in your ears as sound. What people do not realize is that light travels faster than sound. So the afferent loop of the reflex arc is not a sound wave. The second wave that comes to the ear is the slower sound wave. This acoustic phonon is always tied to light coupling by melanin in the external ear before the sound gets to our ear drum. IS TINNITUS AN ALLERGY TO nnEMF? Tinnitus is the acoustic pathways in the brain trying to heal itself but they cannot because our environment is littered with nnEMF of all sorts. This ruins the ability of the ear to tune into the sound the environment is providing. Tinnitus arises when this flexibility goes bad inside of the mitochondria in the brain stem and cochlea. 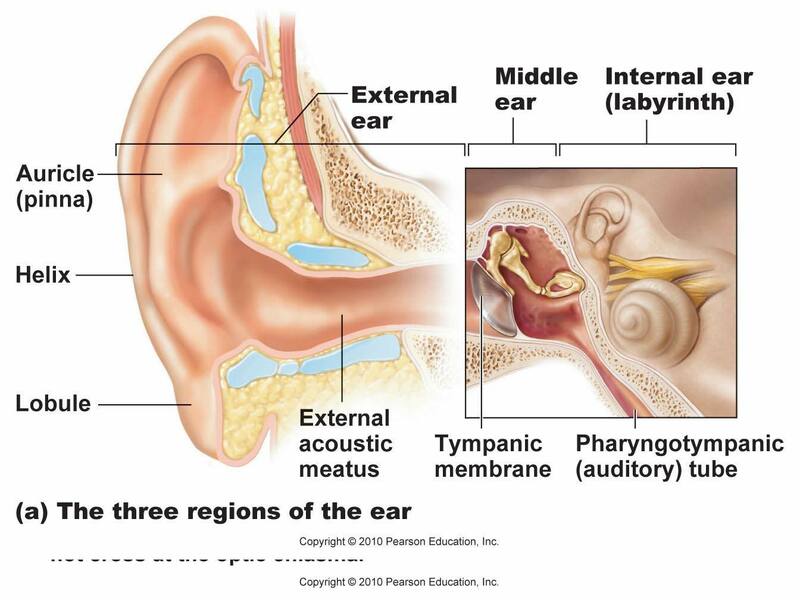 It begins in the external parts of the ear. Tinnitus is effectively, a de-tuning of the mitochondrial oscillations that develop in Ammon’s horn of the cochlea which is looking for the right frequency. The frequency has to be matched from the external world to our intenral world with our colony of mitochondria inside Ammon’s horn. In this way, mitochondria deep in our ear can increase tunneling speeds to match the incident EMF frequencies to become better able to use beta oxidation for fats and the TCA cycle for glucose. This also creates water in the cytosol of cells. Beta oxidation produces a ton of water and glycolysis produces very little water. The membrane in your cochlea uses frequency matching to work with EMF’s and sound waves around you. The key to understanding neuronal function in the auditory system is understanding how a reflex organizes the entire nervous system. This goes back to the work of Sherrington in the 19th century I mentioned earlier. Bereft of “proper” incoming EMF signals, the neurons lose the feedback control and they begin to do things they usually would not do. The fastest incoming afferent signal is from sunlight that activates and excites melanin’s electrons. When this afferent loop is chronically absent or disrupted, this is what gives the phantom sounds of tinnitus. Neurons tuned to the tinnitus frequency in the auditory cortex became less active, thus this alters the reflex arc between the cochlea and the auditory cortex and brainstem. In all of these places, their is wide spread energy deficits in mitochondria that reduce the activity of neurons. Calcium efflux is usually behind this secondary effect. Calcium flows are linked to energy production from incident light EMF’s. Our cells are optimized in their physics to work with sun light. When we force them to sense nnEMF we get lower energy flux output in our tissues. It turns out, out of the 5 senses, our hearing sense is using the most energy because of its ability to distinguish waveforms is so sensitive. It turns out that our environmental lighting is critical in hearing sensitivity and tuning because it forms the afferent loop of the reflux arc. This is why hearing acuity rises in darkness. How is that for a curveball you did not see coming? For example, all humans can tell the difference between a sound that is 30 Hz or 60 Hz. The same is not true about our eyes and vision. Few people can sense the difference between a pulsing light at 30 cycles a second versus 60 cycles a second. How does the ear operate differently than our eyes? It transduces light signals to acoustic phonons first, by fine tuning the membrane responsible for hearing sound using the afferent loop. That loop is light mediated. Our senses are built in a very specific manner by evolution. Having melanin in the ear is not evolutionary error. Hearing is more sensitive than light sensing when it comes to pulsing of waves. This is why pulsing RF and microwaves are a real problem for all people with tinnitus. RF radiation induce massive electric and magnetic currents on surfaces to disrupt this mechanism. Any modulation of light frequencies also induce flicker effects. The electric power grid flickers too and this is why Scott’s example was used in this CPC. Microwaves cause vibrational changes in water in the cells of this system to alter the electro-mechanical coupling in the ear. These nnEMF’s induce the symptoms of tinnitus to create a horrible acoustic environment, thusly, destoying the resonance of the reflex arc it was built to be an antenna for. To understand how the coclear and brainstem nuclei work with sound consider an example from physics of communication: High-through put satellites concentrate their transmissions through powerful spot beams designed to communicate with small and mobile antennas on the ground. Isn’t this the same mechanism of how sound finds our ear on Earth? Yes, it is. The only difference is the frequencies of the light communication that each system uses to begin the process. Our external ear cartilage is like a satellite dish and the ridging it has in its design focuses the acoustic beams to get to the inner ear. The ridging also increases the surface area for ambient light to strike the melanin present in our pinna and our ear canal. As a result, when some waves are ill pointed or not solar based, or a piece of equipment is broken (melanin mis shaped) and putting out a signal at the wrong frequency, the interference challenge is that much greater to the fidelity of the system and in the human nervous system fails and is usually the result of some type of nnEMF interference. We call this buzzing sound in our ears and our head tinnitus!!! The ear is our most sensitive of the 5 senses because mammals bury a ton of mitochondrial capacity in a giant synapse called the calyx of Held. This makes the auditory relays in all mammals an exquistite redox sensor. Redox is a function of the water a mitochondrion makes so that light can interact with it to make and exclusion zone to generate other signals and waveforms to fine tune our senses. This system is faster at neuronal signal transmission than most other parts of the brain. The calyx of held holds the largest known connections between neurons. This calyx releases an array of neurotransmitters that alter brain stem mitochondria via vibration of EZ in water. This is why microwaves are part of the etiology of tinnitus. The calyx releases neurotransmitters 800 times per second. In contrast to our visual pathways, which do not have as speedy a relay center. The reality of the acoustic design fidelity tells the quantum clinician that the difference in mechanics might mean that stimuli that would be invisible to the eye (UV light) can easily be picked up by the ear. People forget that humans do not have UV vision. Our ear does because of the melanin that it contains externally. The eye’s melanin is buried deep in the RPE of the eye. In the ear, those light vibrations also can fine tune the circadian clock genes present in front of all mammalian genes. This is a true statement of every species tested to date. Does this sound hard to fathom? Scientists are now using these ideas to listen to the sun rays to understand how it really works. I’ve told my members the sun and mitochondria are linked in a deep way physically. 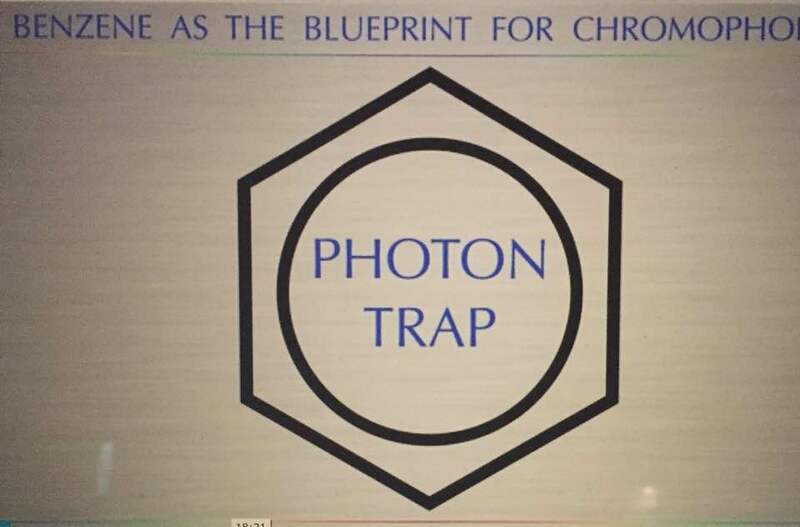 This is just another example of why I believe the sun and mitochondria are connected by excitons, phonons, and solitons by the solar plasma. Our sensory organs are designed to tke advantage of specific aspects of the energy and information in these wave forms to make sense of our environment in ways we are just learning. X-rays and gamma rays are invisible to the eye but science now can assign a sound to each frequency bringing them into the range of human hearing. Scientists have now found that when density of certain solar charged particles change, a sound is made and is audible. This interplay has revealed how energy flux moves in light waves. It also tells us why humans get tinnitus but these ideas are so outside the box of standard teaching with otolaryngology, they deny it. Most are unaware that the sun makes sound. Now you know it. They only deny it because they are ignorant the work has been done in solar physics. They also forgot to pose the fundamental question: Why did evolution put a UV light sensitive pigment all throughout our acoutic apparatus? As a neurosurgeon who trained with the world famous peripheral nerve expert at that time I learned a ton about reflex arcs and the work of Sherrington at LSU. Not once did I learn why malanin was in the ear in medical school or in my ENT rotatation. I found out about it in my neurosurgery residency when I began to do a lot of acoustic neuroma cases and sectioning of the eight cranial nerve for vertigo due to another hearing disorder. Theoretical roadblocks develop in physicians’ minds this way because ideas on new science is in conflict with their ideology from their education. They are only oppose new ideas because of political bickering that is fostered in medical education and training because we’re all fed a steady diet of a belief system of half truths in medical school. I now question every odd thing I uncover in medicine I was taught, because I have found evolution and biology rarely do things without good reason. The reason is often tied to how nature fundamentally works in her framework and not the one taught in medical schools. And because of my new perspectives on things, I have I found just about all of my education is based upon half truths. When scientists have listened to the sun tuned to human acoustic range they found a hum occured at 137.5 cycles per second that is a sound close to C sharp below middle C. This lead science to look for connections of the sound to light charge changes. Guess what they found? They found the sound changes as the solar winds charges vary. What specifically varied in the solar wind? Carbon isoforms varied. Immediately I linked the carbon hexagons in aromatic amino acids that form tyrosine to make melanin. These rings in proteins absorb UV light as a photon trap. Melanin is a photon protein trap for UV light. It is how animals have copied plant chromophores in chloroplasts to absorb solar energy in wireless fashion photosynthetically to create other forms of energy, signaling, and for information transfer to make sense of our environment. Aromatic amino acids make up much of the proteins we are made up of. Dopamine and melatonin happen to be two such proteins. Melatonin has the ability to lower heteroplasmy rates within the acoustic system. So when melanin cannot do its job in the ear, melatonin drops and mitochondrial vibrations change and tinnitus manifests much more easily. HOW WAS THE LINK TO SUN MADE BY SOLAR SCIENTISTS? Alexander Wicks found using data from the Advanced Composition Explorer that the sounds varied with magnetic particle flows of carbon. Didn’t I tell you earlier that acoustic phonons are controlled by magnetic fields? Do you see the connection developing here now? The sun has two main carbon isotopes. One isoforms has all four of its electrons stripped from it, and the other isoform has just 4 electrons stripped from the six carbon has. The acoustic harmony these guys created allowed them to sense the sun’s harmony, or better phrased, to listen to its solar circadian turnover of carbon inside of of the solar wind. It turns out carbon has a strong harmonic presence in the sun. I have sense the same relationship exists in our acoustic system and is why melanin is part of our ability to hear properly. We need solar plasma input to fine tune the system. When the carbon flows are off in our colony of mitochondria of the neurons supporting hearing, I believe tinnitus is the resultant symptom a human gets. You find this quantum mechanism in any book. This idea is entirely new. What causes carbon turnover in cells? Ubiquitin marking does. I have an entire series on my blog on this topic and how it works inside cells. Ubiquitin marks proteins for removal because they are no longer working well as light antenna’s in our cells for some reason. It turns out that all the ENT researchers have to do to test my theory is look at the ubquitination rate of melanin cells in the external ear and cochlea to see if I am right in tinnitus. The main reason ubiqutination is up-regulated to replace melanin which is altered 3 dimensionally in tinnitus, in my view, is from nnEMF bombarding the external ear first. Why do I believe this today? It turns out the frequency of the hum in the sun revealed something else rather interesting. It corresponded to variation over 27 days. That is the time it takes the sun to revolve once upon its axis. The solar wind has a fast and slow component the speed is linked to the type of carbon creation and movement in the sun. The fast moving wind comes from dark, cooler regions in the sun’s outer atmosphere called the corona. Magnetic field lines in these regions are not densely packed so they let particles escape faster to head to our senses via the solar plasma Earth receives. To slow the wind, we need hotter temperatures, to destroy magnetic flux that contains this energy in the sun. As the temperature rises, the magnetic field becomes more dense and it retains light. These area have more energy to strip the carbon of its electrons. This is very similar to what we observe inside the mitochondrial matrix with H+. The first three cytochromes contain de-hydrogenases that strip hydrogen from foods. Then our mitochondrion strips the hydrogen removed from food of its electrons in the mitochondrial matrix. Nature holds the secrets to all diseases. It is my job in this life to keep following her data stream. She is an amazing teacher. Antigens and cell membrane recepetors sit next to cell water and to the extracellular compartment. CSF is 99.9% water. That water comes from the blood plasma as an ultra filtrate of this blood plasma. This means that cells in the blood plasma might have some affect on the water in the circulatory system that eventually becomes CSF that surrounds our brain and the eighth and nerve cranial nerve complex in the cerebellar pontine angle. Melanin is known to affect water chemistry in man. These two cranial nerves are surrounded by a sea of CSF in the cerebellar pontin angle. They are both known to be associated with tinnitus. RBC’s have many antigens on them and they vary based upon the blood types that people have. 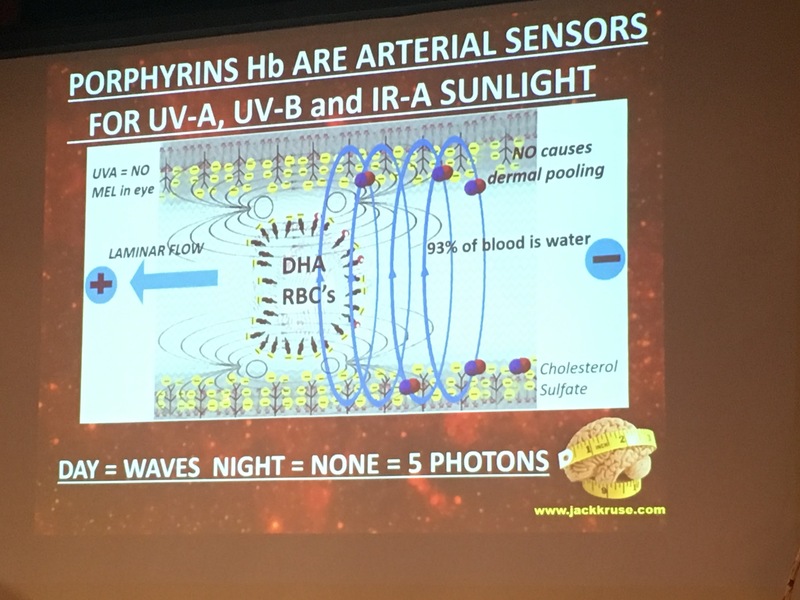 RBC’s also have porphyrins that absorb all UV frequencies the sun releases to Earth. This means that melanin and RBC’s can frequency match any UV light they both absorb to transfer energy and information bi directionally. This is critical in the ear. Since humans have a various RBC’s antigens, this implies that we should not expect all people to have the same rates of tinnitus formation even if they were in the identical environments for electromagnetic pollution. Those antigens respond to different electric and magnetic fields and those field effects can change how voltage gated channels work as the picture shows below. This gives a variable non linear effect because the light wave is ultimately respnsible for the type of free radical signal a mitochondrion makes. This makes the incoming EMF frequency very critical part of the mechanism in tinnitus. Electromagnetic fields can activate of voltage-gated calcium channels (VGCC’s) in the plasma membrane of cells. When electromagnetic fields activate these channels, large amounts of intracellular calcium (Ca2+) are produced. Calcium is the key secondary messenger for these antigens on the surface of cells and they interact and react with RNS species like peroxynitrite. This excess calcium within the cells produces a chain of chemical reactions leading to the production of free radicals and oxidative stressor chemicals as the result of the altered electric and magnetic fields. The free radicals then culminate in mtDNA damage and can induce DNA damage too. They key intermediate effect is that any nnEMF incident ray is fully capable of dramatically changing in the plasma membrane of cells that can lead to the electromagnetic hypersensitivity symptoms. I believe that tinnitus globally is the number one form of EHS afflicting modern humans today. I think it is more common in the US because of how our power grid works compared to other countries. I think Europe has other forms of EHS. I think Australia’s dominate form of EHS will be found in its extraordinary rates of autoimmunity and skin cancer incidence and prevalence. My views are entirely new and my own based upon what I’ve learned about the sun and man’s uses of the light spectrum. Our use of the spectrum takes no consideration of the biology effects mentioned in this blog. The calcium efflux is due to the alteration of the MCU transporter in the cell membrane and this alters the amount and time excess calcium can flow directly in and around the cell and in its local environment. So with respect to RBC’s, it also means that this effect of electric and magnetic fields will also effect the surface of the blood vessels as the RBC’s and the antigens pas through the circulatory system. This will change the ferritin levels in blood and alter the charges and oxidation states of iron in the blood to lead to many other electromagnetic changes we now call circulatory diseases. We just have not made the connections in textbooks yet because no one will fund nnEMF research. We might find we are the biggest problem to our health. God forbid. Wall Street might develop a -fib. Oh…….cardiac abnormalities are another symptom of EHS too, in my opinion. All of these mechanisms alter the amount the time nitric oxide (NO) can act within cells and in arteries to cause disease. Moreover, when NO release is abnormal it occurs because NO relases is quantized by solar EMF’s in the optical tissue window of 600 nm-1400 nm. The combination of IR-A and UV-A light seem to be what it is optimized around. When NO is not quantized to solar light its release and action are eratic and non linear, and when this occurs chronically it dramatically effects mitochondrial function. The picture below shows you how light becomes a sound wave to knock NO loose from the inside of vessels in the circulatory system to affect cytochrome 1, 2 and 3 in local mitochondrion within the vessel walls. NO makes skin vessel come closer to the surface. This is where melanin resides in the skin. This is why the ear has melanin. 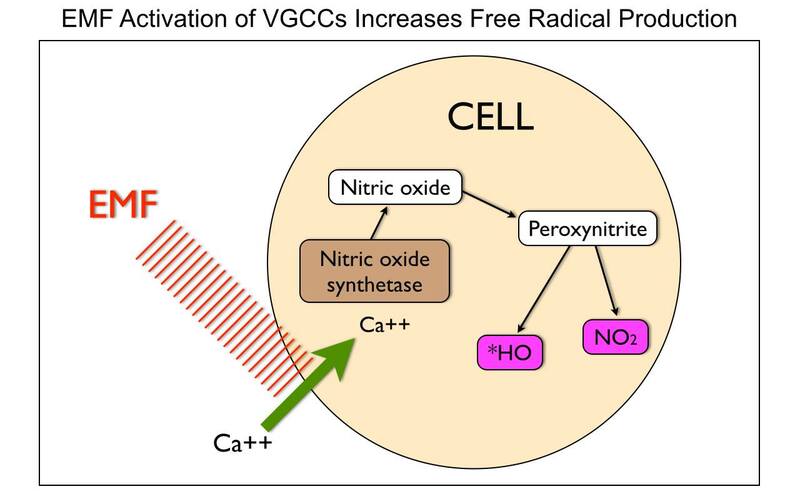 The increase of nitric oxide is a chamelon for cells. It mimics the diurnal changes the sun gives us. UV-A light’s presence is based upon a variable timing mechanism on Earth. What happens on the equator with UVA light is not the same that occurs in Scotland. This why haplotypes of mitochondrion vary with location as well. Endothelial nitric oxide synthetase has a quantum superposition effect on sulfur and nitrogenous groups in these antigens on cell surfaces. This means the electromagnetic signal can have a variable non linear effect on sulfation and nitrosylation pathways. It can result in therapeutic effects or detrimental effects in the blood plasma to lead to variable mitochondrial energy flux in mitochondrion. This is one reason why non-thermal electromagnetic fields (PEMF) are increasingly used in medical therapies. The paradigm currently believes that the RF/microwaves in PEMF devices can be beneficial therpeutically, but they fail to realize that this eNOS switch is very sensitive to light controls. For example, if one is in an environment that fosters chronic nitric oxide release this means there will be a relative lack of sulfation of the skin, arteries, and RBC’s and this would favor the activation of the reactive nitorgen species of chemicals. This would cause arterial calcification. In fact we now know that nitric oxide can also interact with superoxide (OO-) form altered mitochondrial function to create peroxynitrite (ONOO-). It has been found that when peroxynitrite breaks down, it creates reactive free radicals and oxidative stress within cells and this likely leads to many of the symptoms of EHS like tinnitus. There has been many reports, mostly unsubstantiated, that EHS and type O blood might be somehow linked, but I think this is unlikely. It is the most common blood type world wide and just from a numbers stand point, if this were true we should see massive EHS globally and yet we don’t. We do, however, see that EHS is more common in EU and tinnitus is very common in North America. The incidence seems to be higher in EU outside the tropics. I think the power grid’s oscillations and the latitude anemia link is more likely. EU power gird oscillates at 50 Hz and the USA oscillates at 60 Hz. EHS seems more common in the EU and tinnitus and atopic dermatitis and migraines are more common in the USA. Are their other possible explanations? Yes. Low solar exposure from any reason = lower quantum yield and this always leads to higher risk of chronic anemia and we know this from Fritz Hollwich work in the 20th century. This would would lower the energy of the blood plasma and this would affect the activation of T-regulator cells and the amount of EZ in the CSF that surrounds the 8th and 9th cranial nerve complex in the CSF. This alteration of T-regulator cells is why Australia has massive amounts of autoimmunity in their country. I also think it is tied to their rates of skin cancer. But that is a blog for another day. Morever, this cranial nerve complex is directly adjacent to where people hold up a cell phone to the side of their head as well. This would generate electric and magnetic fields capable of simulating the power grid’s effects because all mobile phones use RF/microwaves to send and receive signals. Low solar exposure and anemia also are linked to allergy development via T regulator cells and activation of the immune system. I believe allergies and EHS are linked and I think EHS maybe an allergic reaction to non native electric and magnetic fields that begins in the blood plasma. I’ve come to the conclusion that the predisposition to allergies in children may be a big factor to developing EHS symptoms in adults. I also believe the EU power grid oscillation is a real stimulus for this condition. People with allergies tend to be more sensitive to all sorts of things like dust, foods, hot, cold and react excessively to small stimuli. This reeks of a non linear effect of light. In fact, Raynaud’s phenomena and chemical sensitivities are prominent features of EHS and autoimmune conditions are also linked to tinnitus. It seems once the bodies immune system becomes primed by the altered electromagnetic fields, melatonin drops and mitochondrial heteroplasmy soars and the electric and magnetic fields act like a fuse on a stick of dynamite and might lead to many allergic symptoms. Humans are allergic to nnEMF because we are optimized to solar EMF’s between 250nm-780nm. We forget we are part of nature. Nature does not reason with us. Nature is no democracy. Nature doesn’t sit down with you and start a discussion………you need to remember how you were made to exist within her frame work and if you do not, disease is the result! Simple. Mankind has not woven the web of life. We are but one thread within it. Whatever we do to the web, we do to ourselves. All things are bound together. All things connect in ways few understand. Almost any disease is curable.…… Just not every patient is because they refuse to alter their environment to suit their mitochondrial genome. You cannot get well in the same environment you got ill within. It’s a stark and unpleasant message that most people don’t want to ponder. Enjoy your cell phone and technology but it might becausing your ringing in your ears. trying to find a way to stop tinnitus or control it. any combination of natural vitamins or herbs that will help this problem?